The Mitral Valve (arrow in diagram) regulates the movement of blood from the left atrium, or left collecting chamber of the heart, into the left ventricle, the main pumping chamber of the heart, which pumps blood to the body. 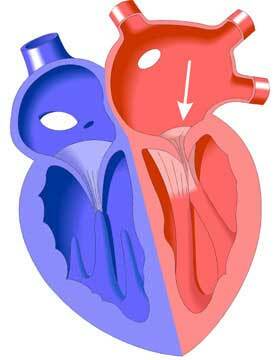 In Mitral Stenosis, the mitral valve is defective in form, narrowing the orifice for blood to enter the left ventricle. This can be in isolation such as a parachute mitral valve with a sing papillary muscle or in a constellation of left heart obstructive lesions (mitral stenosis, aortic stenosis, coarctation of the aorta). Mitral Stenosis, which is 4 times as likely to occur in females as in males, can be congenital or more commonly acquired as a result of scarring from Rheumatic Fever.